I’m usually a bit of a flake when it comes to Instagram sewing challenges- I see the challenge, maybe purchase a few supplies, and then get distracted by whatever other projects have landed on my cutting table, only remembering the challenge on the last day as everyone that participated throws up their awesome projects. It’s like being invited to a party, turning it down for another event, and then seeing the photos of how much fun it was in your feed. I’m really excited today though, because not only did I get the party invite, but I actually went to the shindig! That’s right, I sewed my own Burnside bibs for the #sewbibs challenge. 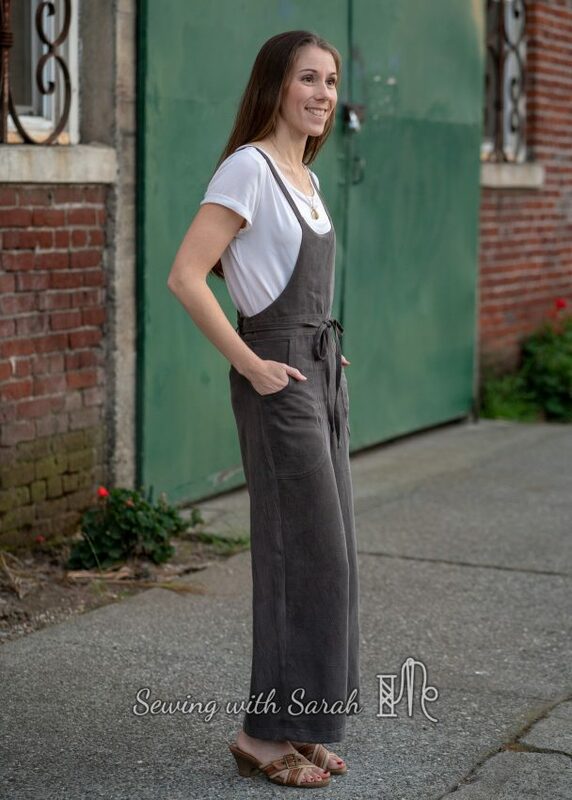 Yes, today is the last day to post, so I’m showing up “fashionably late”, but I’m still here, with a finished pair of bibs to share for all my late night sewing this week! (totally giving myself a little pat on the bib-back here). 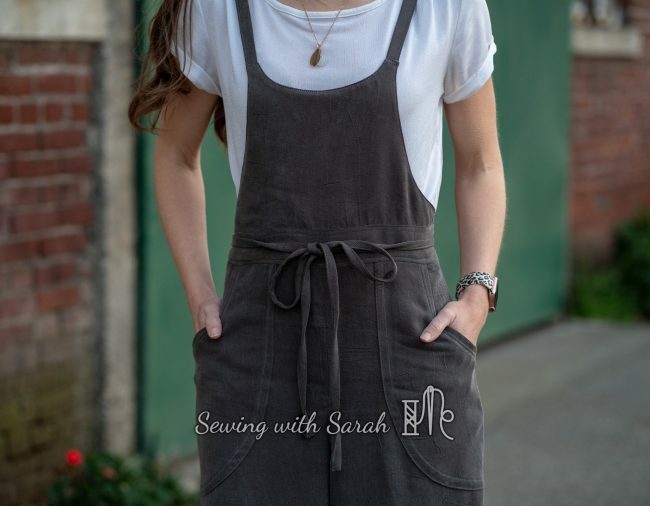 I’ll admit that prior to attending the SewExpo conference in January, I had zero intention of ever sewing, or wearing, bibs/overalls/dungarees. 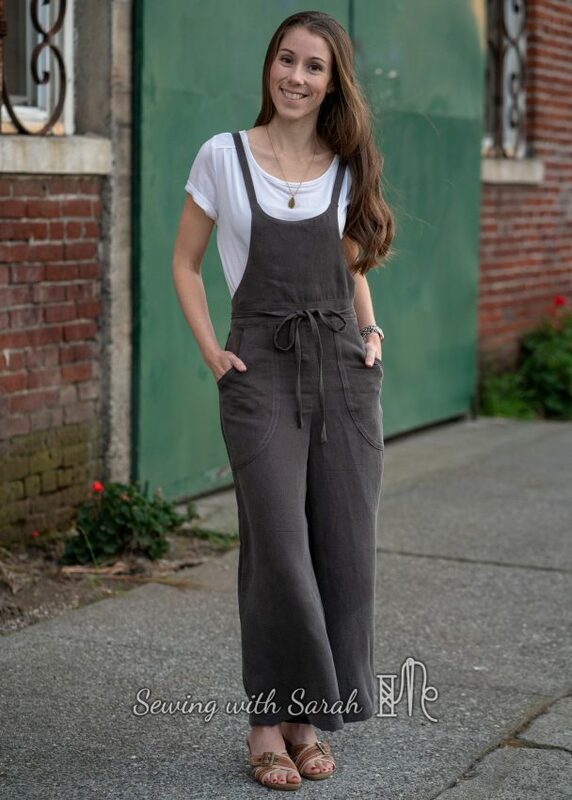 I didn’t think the look would flatter my petite build, and I wondered about how “practical” they would feel for everyday wear around three kids- would I feel like a giant toddler? would they be nursing friendly? 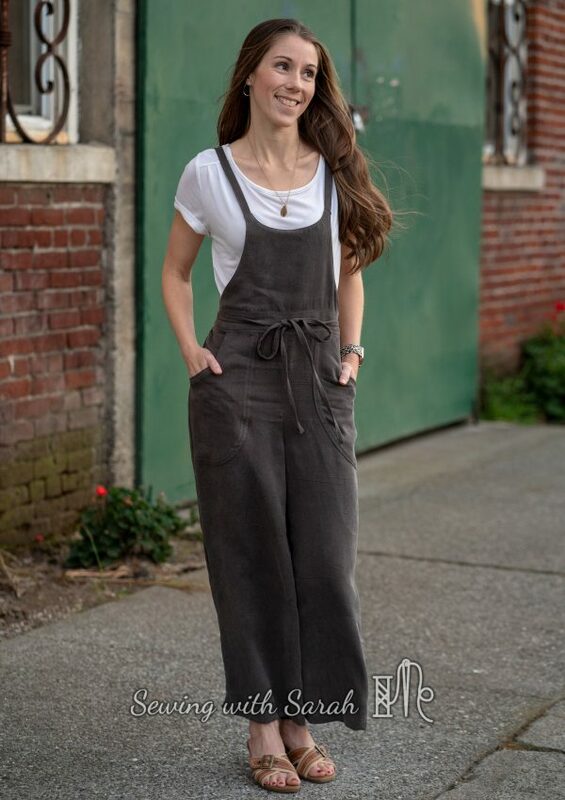 Would they remind me too much of junior high (which is the last time I wore overalls, and not a phase of life I love to remember)? 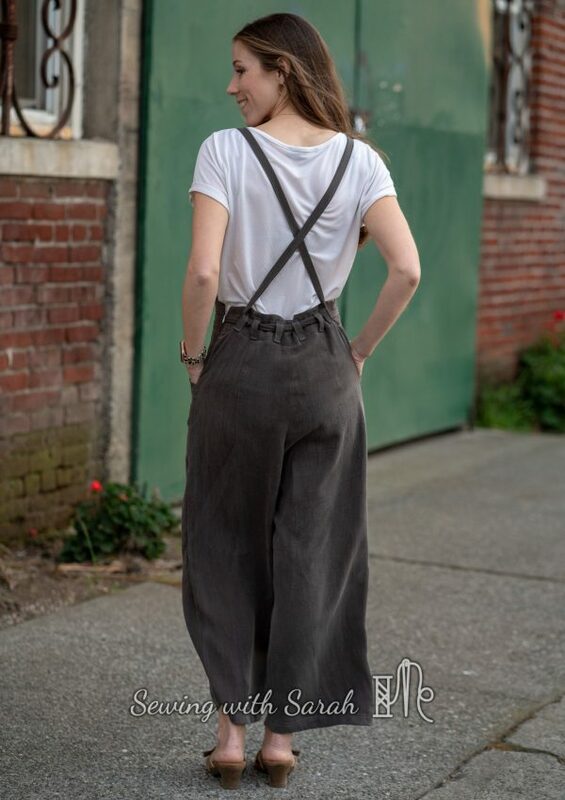 However, seeing the Burnside Bibs design modeled by Peggy herself (who happens to also be rather petite, like me) at the Expo made me re-evaluate my anti-bibs stance, and on a whim, I purchased the pattern and a few yards of tencel twill from Stylemaker Fabrics. The fabric and pattern could have easily gotten buried in my post-expo to-do list, but it stayed on my mind as the #sewbibs challenge was announced, and my Insta-feed was flooded with inspiration. This inspiration kept on coming throughout March and April, and while I was a bit intimidated by the whole project (drapey/shifty fabric? check. zipper? check. pants fitting? check) I didn’t want to miss out on my own pair of awesome bibs. The week after I finally got it all cut out, I decided to try on some bibs at Target, just to get a feel for the style. It was a disaster- they looked terrible on me, accentuated my hips, and made me look like a cross between a gardener and a grandma. No offense to bib-wearing grandmas- it just wasn’t a good look for me. I panicked, and wondered if I had made a huge mistake with my gorgeous tencel twill. I decided to put the project aside for a moment, and sew up my Willamette shirt, just to get more comfortable with the fabric. 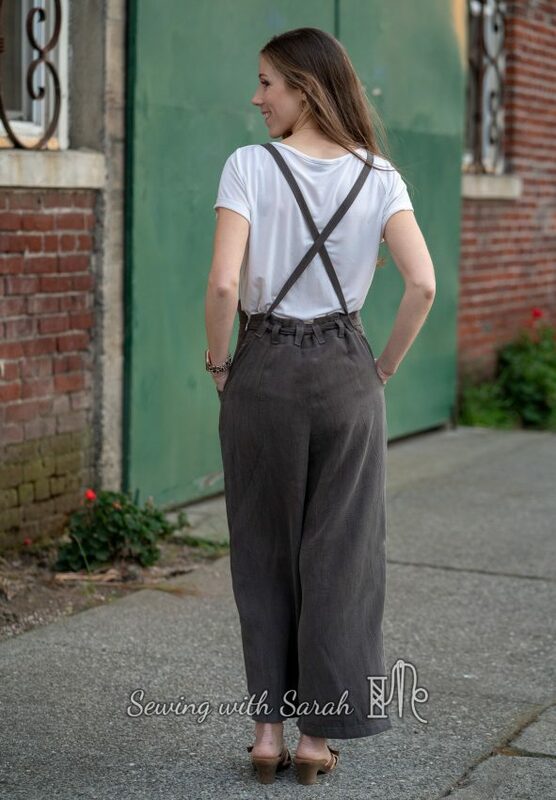 While the Willamette was a bit of a challenge, it wasn’t impossible, and I discovered that tencel twill could be tamed with a little steam from my iron and careful cutting, which eliminated a few of my pre-bibs hurdles. Finally, this past week, I decided that since it was already cut out, I might as well give it a shot, since there wasn’t much else I could do with all those pieces of fabric. I was continuing to see so many stylish examples of bibs on social media, and I really, really wanted to be wearing my own pair. The construction was fairly straightforward- I chose Version 1, with the side zipper, for a more fitted look. I used an 80/12 universal needle, lightweight pro-weft supreme interfacing, and my serger to finish the seams where instructed. I followed the instructions and the sewalong carefully, only deviating twice- once to under stitch the bib area, and once to use the folded strap method in the sewalong, rather than the stitch and turn method in the instructions. I tried the stitch and turn method first, but couldn’t get that sucker turned out for the life of me- I only got halfway through, and needed an emergency hand massage to regain feeling in my fingers before I could continue sewing. 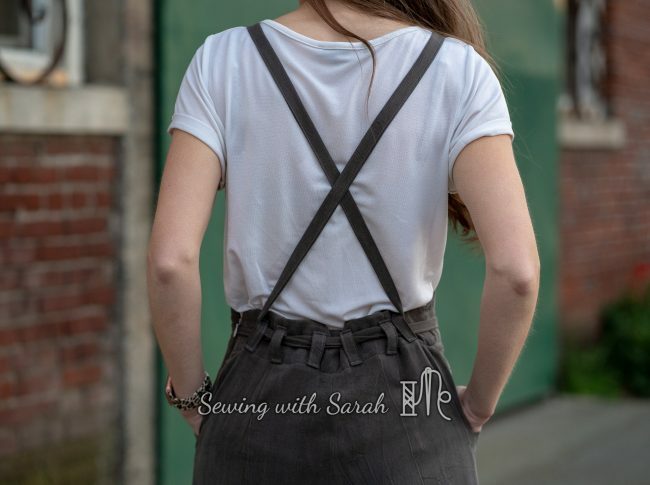 I also left off the back pockets- I was concerned about getting them to hang straight in my shifty fabric, and didn’t want to risk a wonky looking back. I actually really like the smoother back view, and since the front pockets are plenty deep enough for my phone, I can’t imagine missing them. Other than those small changes, the bibs went together really smoothly, even the zipper installation and topstitching the facing down, two parts of the project I had been dreading. When it finally got to the point where I could try them on, I was thrilled- the fit was excellent, and they were so comfortable! Not only could I see myself wearing them around the kids, I could also easily nurse, since the bib doesn’t go up very high, and the wide legs and sophisticated fabric left no impressions of junior high angst. 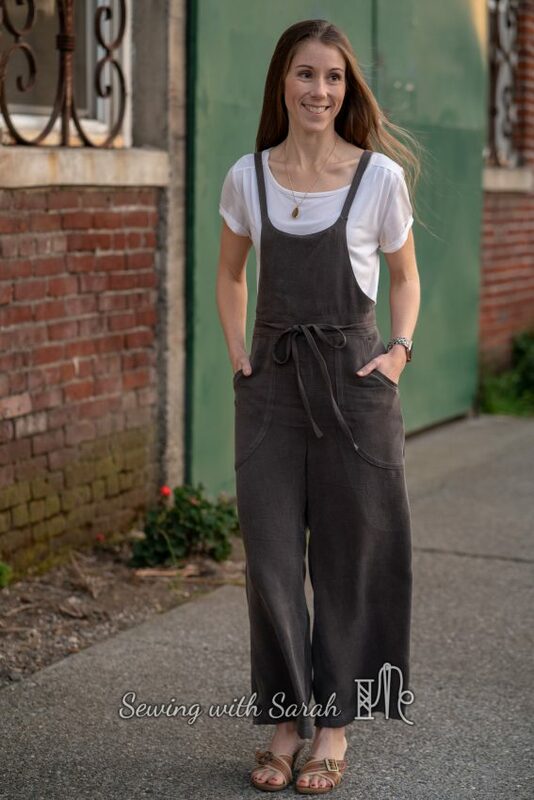 Most importantly, the narrow bib, waist ties and wide legs seemed to balance my petite figure well, and left plenty of casual and dressy options for styling. I cut the cropped length, and took a 1″ hem, which meant I didn’t even need to do any shortening, to get them to hit right above my ankle. I love it when pants hit in this spot, since it means I can easily wear them with heels or flats, and they won’t drag on the ground and get dirty. After the last hem was sewn, I immediately went online and ordered a couple more yards for another pair (before the discount expired! ), a sure sign that they’re a hit! 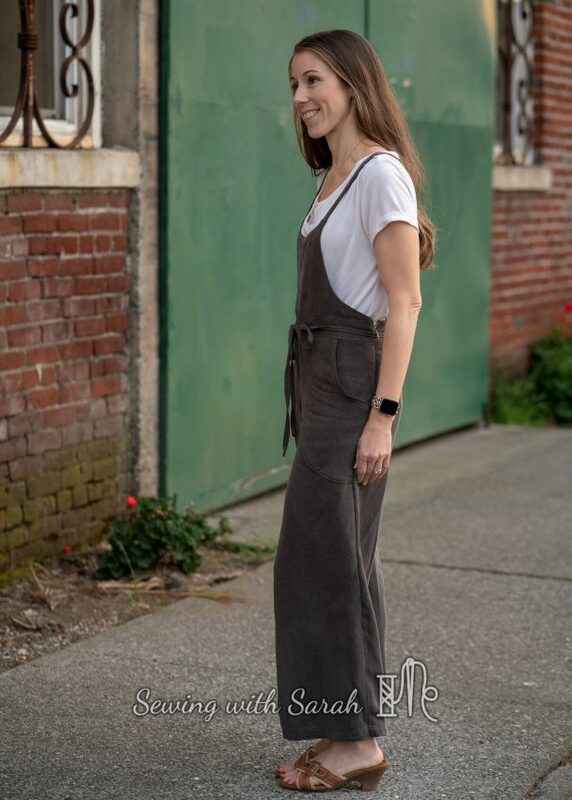 I apologize if this post is a little photo heavy- I just love these pants- the tencel twill feels amazing and has that “worn in” look right off of the machine. Note: I originally intended to take these photos in our usual spot by the canal/path, but Spring has really sent some high winds our way this week, and we had to find another spot at the last minute. While that was a bit stressful, it was fun to re-visit this downtown location- how cool is that door? If you’ve been following my blog for a while, you might remember the spot from my Midway Bomber photos, which was only our third photoshoot ever! 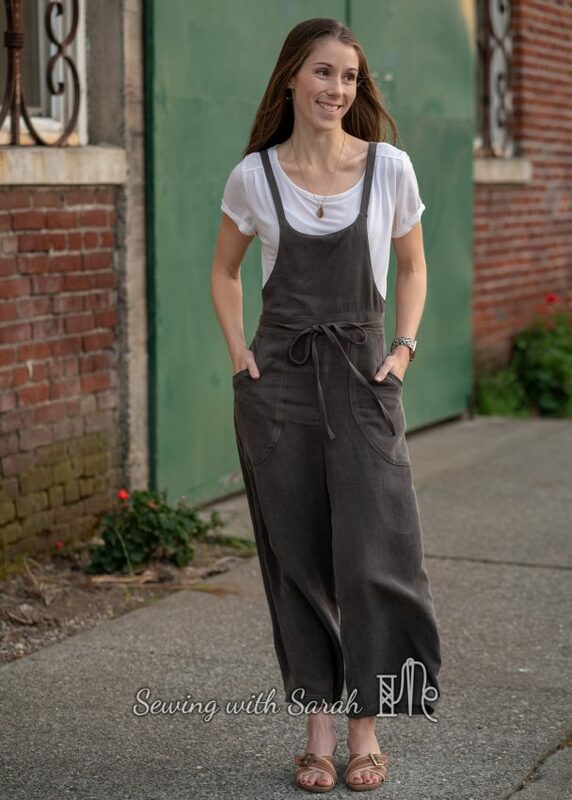 A big thanks to Peggy, of Sew House Seven, for designing and modeling this design in person, and to Meg, Teri, and Heidi for hosting the challenge and throwing all that inspiration my way! If you want to read more about the challenge, and check out the bibs pattern round-up, you can do that here! Have you sewn bibs yet? How do you feel about the style? I’d love to hear your thoughts in the comments! 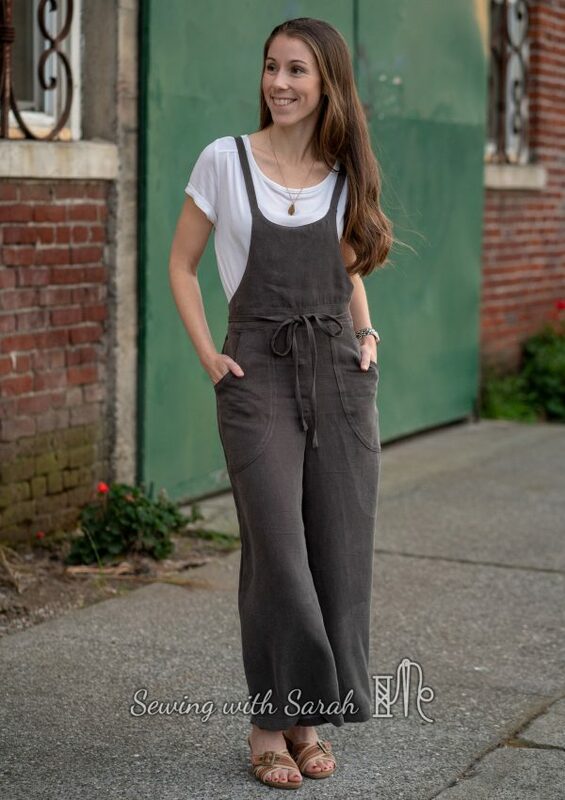 Your bib overalls look much more fitted (and pleasing) than the pics on the pattern. 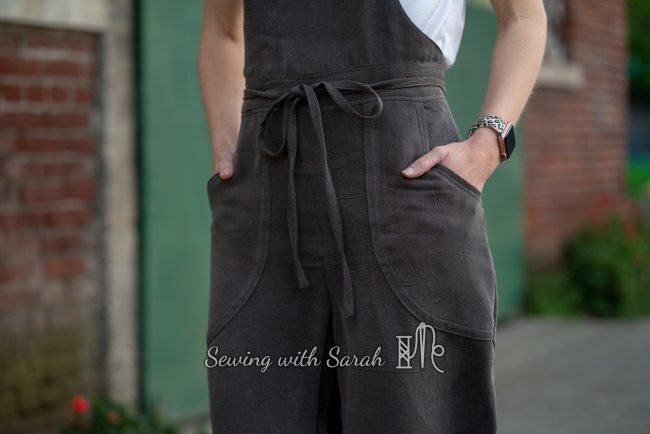 I like the tencel twill fabric drape! 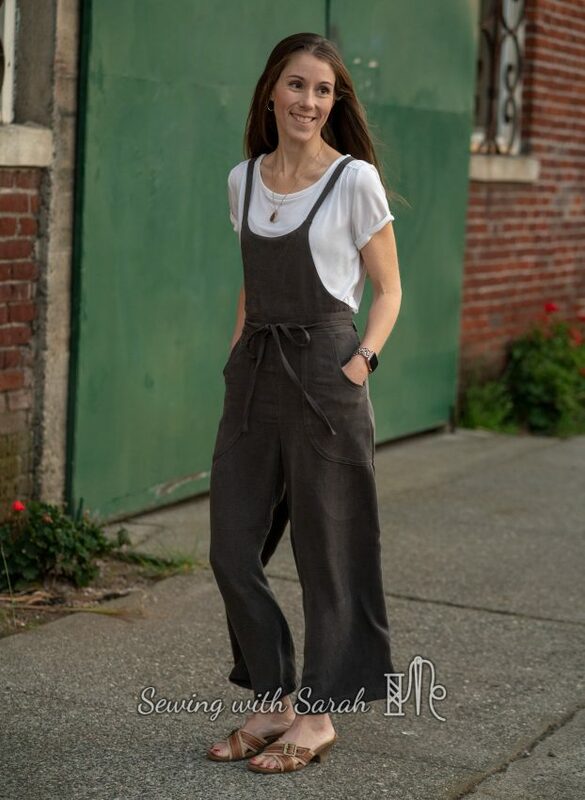 The tencel is an inspired choice for this pattern, soft enough to not look bulky, substantial enough to show off the shapes of the garment pieces, and as you say, has that great “worn in” look from the start. I think the drape of the tencel gives a high-style look to the bibs, which TBH is a tricky style to wear. Yours are gorgeous on you and are a great example of how crucial fabric choice is to the success of our makes!